Todd Gitlin. 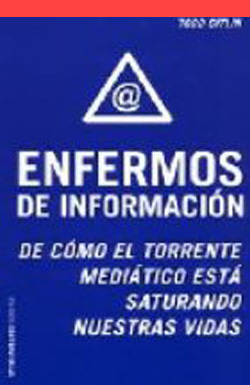 Enfermos de información: de cómo el torrente mediático está saturando nuestras vidas. Barcelona: Paidós, 2005, 310 pages. Translated by Marta Pino Moreno. ISBN: 978-84-493-1713-2. Spanish translation of the original title: Todd Gitlin. Media Unlimited: How the Torrent of Images and Sounds Overwhelms Our Lives. Pan Macmillan Publishing, 2003. Published in Spanish by Paidós.